Middle and high school students, come to Field Night and invite your friends! 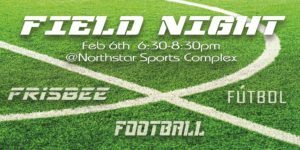 Come out to the Fieldhouse at the Northstar Sports Complex for what will seem like a mid-summer break in the middle of winter. We are excited to be able to use the Northstar Sports Complex again to host this event! There is no regular scheduled youth group, but we will be having fun with Football, Frisbee, and Soccer. We will be running around and playing a few different games, come dressed for the turf and to move. Don’t forget to invite a friend to bring as well! We will be meeting at the Northstar Sports Complex, not at the church. The fieldhouse will be divided up so that there will be a couple options for students to play at a time. It will be a great time for some fun on to get out and play and a nice break from the cold in the middle of winter. By checking this box I authorize my child(ren) full permission to participate in the events and activities organized by the Student Ministries of Lake Community Church. I understand that possible risks and dangers may be encountered on any given trip or event, and I the parent, trust the judgment of Lake Community Church, its pastors and staff, and volunteer leaders. In the event of an emergency or injury to my child, I grant permission to Pastor Paul Peterson or a volunteer leader to seek appropriate medical attention for the injury to my child including visits to the emergency room or a doctor, X-Ray examinations, anesthetic and/or other medical/dental needs. In the event of an emergency or injury, the church representative, staff or volunteer will first attempt to contact and consult with the parents and/or emergency contact person provided on this form, and will only continue to seek medical attention without parental consultation if the parent or emergency contact cannot be reached and if the situation is deemed necessary or extremely urgent. Understanding the above notice, I release Lake Community Church, its pastors and staff, volunteer leaders, and any event staff/volunteers from any and all liability claims for sickness, expenses, damages, medical services and injury, even injury resulting in death. I give Lake Community Church permission to use my / my child’s photo and video.I do not give Lake Community Church permission to use my / my child's photo and video.